Well this is a first – my training plan for a marathon has actually resembled something that I would recommend other people follow, rather than my usual haphazard training plans. A fortnight ago I did my longest training run,on a gloriously hot bank holiday in Newcastle (and got seriously dehydrated along the way). Last weekend I went down to London and ran about the city at race pace, but only for 13 miles. I didn’t follow the marathon route as I’d initially planned, but instead constructed a running tour of the nation’s capital to take in all my favourite sites whilst dodging tourists and hurdling over street furniture. This week I’ve been doing some fartlek training, trail running and longer sessions of low-impact cardio work (elliptical trainers, spinning, swimming). I’ll get out this weekend at some point for a long slow run, just to keep me in the mindset of turning those legs. A new race belt – my old one had lost some of its elasticity and developed the annoying habit of letting energy gels slip out through its loops. The new one, by CompressSport, has three attachment points for my race number as well as space for plenty of gels on both sides. 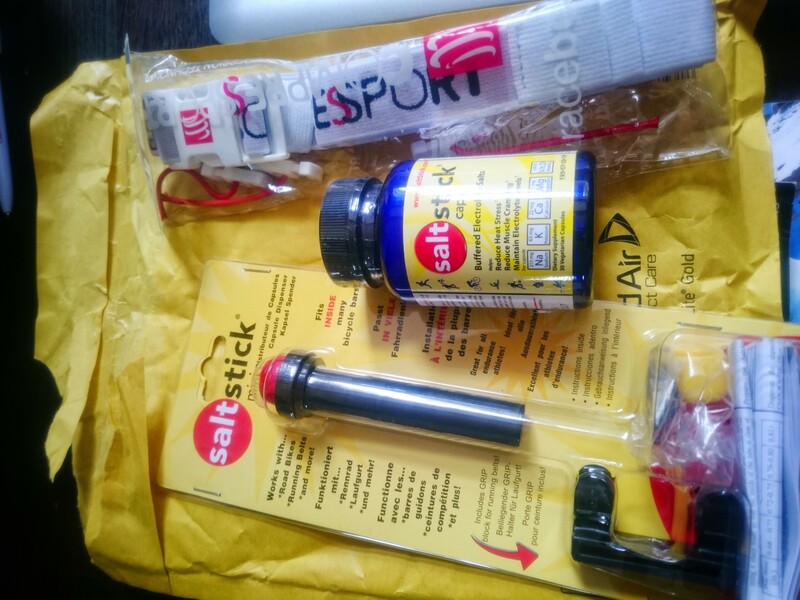 Salt Stick and mini dispenser – after getting massively dehydrated doing my longest run in Newcastle, and remembering how low on electrolytes I’ve been on other events such as the 2014 Paris marathon and 2014 Nice Ironman, I decided I should re-assess my electrolyte supply. Elete electrolyte add-in pocket bottle is great for trail runs when I am carrying a pack, but on faster road races, I’ve decided to go with Salt Stick capsules. Easy to measure (pop one in your mouth once an hour), each capsule contains sodium, potassium, calcium and magnesium to replace the electrolytes you lose during exercise. I purchased a mini dispenser to dispense these capsules during the race, but the one I received is defective. Fortunately, the good people at Racing the Planet are rushing me a replacement – thanks for the great service! New toys speedily delivered by Racing the Planet!